DSAOC Volunteers are IN THE NEWS! 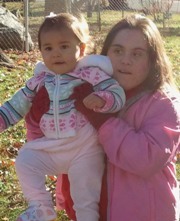 Sisters, Paige and Emma Peplow, give their valuable time and talents to DSAOC and the families we serve. 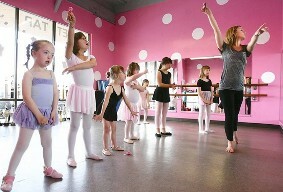 We are so happy the Daily Pilot put their story in the news. 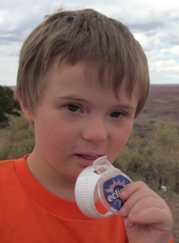 Posted in Uncategorized | Comments Off on DSAOC Volunteers are IN THE NEWS! Three “CHEERS” for Behr Cares! The “Behr Cares” team donates their colorful talents to the Down Syndrome Association of Orange County. “Behr Cares”, the community service group made up of Behr employees from the Behr Paint Processing Corporation in Santa Ana, not only donated paint and painting supplies to DSAOC, they also gave their time and talents! Spring is here, and it’s the perfect time to do some cleaning and add some color to white walls, which is exactly what DSAOC had planned to do when it reached out to a parent that is connected to the organization and also works for Behr. Not only did DSAOC get the donated paint, they received the great news that the “Behr Cares” team would come to the DSAOC Center and add some color and excitement to the activity center. On Friday, March 11, the transformation began. The “Behr Cares” team designed and painted a fun ‘Orange County themed’ mural in the activity center for our families to enjoy. Special thanks to Hector Perez, Jeanne Duncan, Doug Dow, Eric and all who took part in the Behr Cares painting project at DSAOC. We hope this story will prompt other great company’s to pay it forward by helping their local non-profits in any way they can. 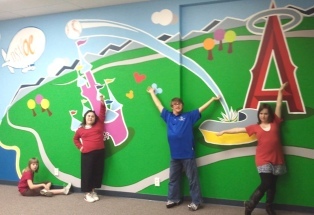 Becca, Alex, Sean and Shanel - Showing off the new mural at DSAOC! Posted in Uncategorized | Comments Off on Three “CHEERS” for Behr Cares! 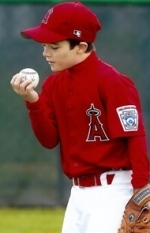 Landon Bell: Landon has taught us how to enjoy every step of a child’s development. He takes joy in the simplest of activities and helps us to be the best parents we can be. It is our hope that he will help to educate others about compassion, differences, and Down syndrome just by continuing to be himself. Gavin McDonald: We love you, Gavin!! Sydney Taylor: Sydney is 28, single and works as a Courtesy Clerk for Ralph’s Portola Plaza supermarket in MV, CA. Sydney is also a volunteer at the South County Outreach (food pantry) on Wednesday afternoons. SCO serves many homeless as well as struggling families in the south Orange County area. Sydney serves within the Newport Beach Church of Jesus Christ of Latter Day Saints (LDS) temple. She LOVES singing with the choir in the Aliso Creek ward, is a great dancer, and enjoys skiing at the National Ability Center (NAC) in Park City, Utah. She loves using her computer to learn via Wikipedia and to stay in touch with friends with e-mails and facebook. Paul Kim: My son, Paul Kim, is 26 years old. He enjoys life and makes people happy. He loves to wear different kinds of costumes. Paul has a girl friend named Yeo Young. Jenna Gorey: Jenna is the best big sister ever! She makes everyone she meets smile, and makes us all better people for having her in our lives. We love you Jenna! Jake ‘The Great’ Kadletz: There would be no way to condense into a couple sentences what this child has done for me and my family. However, the greatest gift of Jake the Great, besides his unconditional love, would be the every day reminder to live for today, in the present and don’t sweat the small stuff. Paul Freeman: Paulie’s picture says it all. It says “Let’s celebrate life!”. Paul has survived some serious (life threatening) complications from open heart surgeries (Tetrology of Fallot) and immune deficiency. If you were to ask Paul (and he could answer), he would tell you his first residence during his 1st year and a half was the 6th floor CVICU at CHOC Children’s in Orange. Indeed, the attached picture shows us how strong he is, and how happy he is to be here. Paul has taught us all to slow down, have faith and enjoy each day. For every twist and turn life brings us, something beautiful emerges out the other end of the journey. Paul has 2 siblings (age 9 and 6) who adore him and celebrate every milestone he is just now, at age 3, finally experiencing. And yes….he has also given us the gift of gratitude. Emma-Jane Bustrum: Emma-Jane is too precious, and the love of our life!!! She keeps us smiling and on our toes all the time. 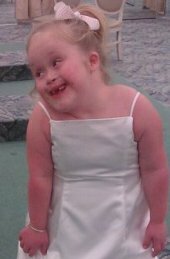 Here is a picture of her in her flower girl dress. She is going to be in a wedding in May. She is such a ham and we love her with all our heart. Alex Perez: Since the day Alex was born, she has opened up my mind and heart to what life is really all about. When days are busy and I forget to show those around me how much I love and appreciate them, she is always there reminding me to stop and notice a pretty flower or give a hug to someone dear to me. Alex has recently become a big sister, and is doing GREAT in that new role. We know Gabriella will grow up knowing that her big sister is special in so many ways. Mark Ward: Mark is our only child. He is the greatest gift we could have. We cannot begin to think what life would be like without him. We are very, very proud parents! Cade Hulder: No matter what your ability is, the love of the game brings us all together. Fourteen year old Cade Hudler is a happy, loving boy who never met a stranger! 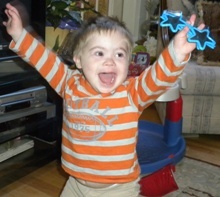 His infectious smile and outgoing personality wins him friends wherever he goes. Cade is a gift from God to all of us. 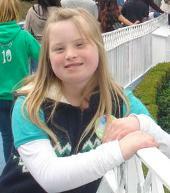 April Clark: This is a picture of April Clark at Disneyland. She is the “sunshine” in our entire family. We love her sense of humor. Join those that have already donated $10 toward the $5,000 goal for DSAOC’s Health Care Education & Outreach Program. 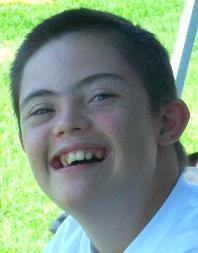 If we each give a little and then spread the word, we can achieve a lot for individuals with Down syndrome. Thank you! DSAOC is a 501 (c) 3 non-profit. Your donations are tax-deductible. 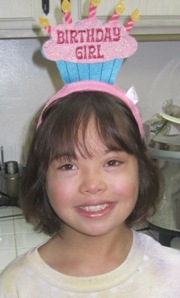 Donate your $10 today in celebration of World Down Syndrome Day and your loved one with Down syndrome. Your donation will be posted on team ‘Down Syndrome Assoc of OC’ on the PCRF Half Marathon website. DSAOC’s participation in this event is funding the Health Care Education & Outreach program. You can also donate directly to DSAOC via the online donation page. 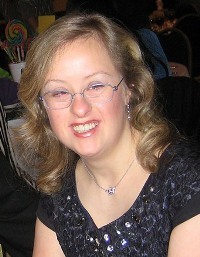 Happy World Down Syndrome Day from DSAOC! Marcus: This is my 12 year old son Marcus. His determination and love of life, people, and all living things, along with his ability to overcome many obstacles in his life, and have no judgment on people has been an inspiration to me and others. 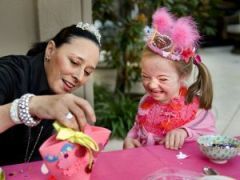 Posted in Uncategorized | Comments Off on Happy World Down Syndrome Day from DSAOC! Kelsey Welch Rupocinski: Even my dreams can come true! 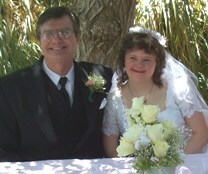 I met my husband at work (Desert Haven,) in Lancaster, California. We have been married for 2 years now and are as happy as can be! 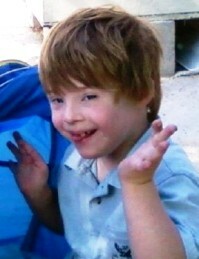 Ayden Sells: When some people look at Ayden, they see a child with Down syndrome. When I look at Ayden, I see how he has helped me realize that there is more to life than intelligence, beauty, money and perfection. He has also taught me that our life together has been less about me helping him reach his potential, but rather about him helping me reach mine. Daniele Lichtenwalter: Daniele lives lightheartedly, she loves wholeheartedly, and she laughs from the depths of her heart! 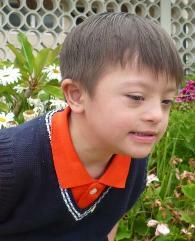 Daniele may have been given one extra chromosome, but that extra chromosome is full of Love! Daniele has truly been a blessing from above and is a great sister! If many years from now her friends and family can say the world is a better place because Daniele was here, then she will have succeeded where many “gifted individuals” have failed! Sometimes we think that Daniele’s mission in life is to fill those around her with affection, love & joy! Throughout the day today, DSAOC will post pictures and words to our Blog and Facebook from our families regarding their loved ones with Down syndrome. Thank you to all who submitted and shared your children with us in celebration of this special day. Isabelle Morris: This is Isabelle, ” Izzy “, our little Princess. She’s now 4 years old turning 5 in August. My husband and I knew all the while that we were having a baby with Down syndrome but we never thought of not proceeding with the pregnancy. We both had fear, but with God’s grace and the support of family and friends, we were able to provide her the best of everything she deserves. She started doing physical therapy at 2 months and 1 hour of PT once a week. Since she’s only getting 1 hour of free service from RCOC, we have been doing exercise with her seven days a week. She started walking at 13 months, and started talking at 2 years old. She’s currently getting speech therapy at her school and she’s been doing well everyday. She loves to sing and dance and is also quite the actress, as she speaks and acts out the lines of her favorite shows. My husband tells everyone that the best part of his day is when he gets home and Izzy runs to him to give him a hug. When asked if we would change anything about her, would we? Our answer is and has always been, “No.” She has Down syndrome, but that has made her the person that we know and love so much. There is nothing that we would change because we would be so afraid to lose the person that is growing up in front of our eyes. We are so proud of her achievements and very proud to be her parents. Great article featuring our very own Audrey Presby. Fancy Nancy: Meet Fancy Audrey! For around the cost of lunch and a beverage, you can show your support for DSAOC’s Health Care Education & Outreach program, which includes funding support for the CHOC Children’s Down Syndrome program. We are asking our families and Facebook Fans to donate $10 to DSAOC today to show that great things can be accomplished if we all join together and give a little. Donate today to show that this is important to you. Join our supporters who have already taken on this challenge and made their donation: Henry and Debby Beglinger, David Etnire, John Bustrum, Yolanda Gomez, Pallavi Dave and Donna Eampietro. Thank you! DSAOC’s Health Care Education & Outreach program consists of: Hospital Outreach: Our Hospital Outreach program provides materials and support to hospital social workers, genetic counselors and OB/GYNs to educate them on the potential of people with Down syndrome and to help them more comfortably and accurately deliver a diagnosis. Healthcare Series Seminars: DSAOC provides health care education seminars presented by medical professionals on a variety of topics related to health care for individuals with Down syndrome. The seminars are recorded and offered to a wider audience of parents and professionals through a video podcast library on our website. CHOC Children’s Down Syndrome Program: DSAOC formed an alliance with CHOC Children’s in 2009 to create the CHOC Children’s Down Syndrome Program, a pediatric clinic serving 240 children with Down syndrome per year. This program is a community-based clinic bridging services and clinical specialists in Down syndrome to help ensure that health care needs are being met. Your donation will support DSAOC’s team at the upcoming PCRF Marathon, which directly supports the Health Care Education & Outreach program. You can also participate on the DSAOC team by visiting the registration page. 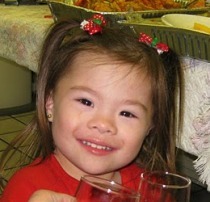 If you have questions, please contact Kellie Perez at kperez@dsaoc.org or call the DSAOC Center at (714) 540-5794.